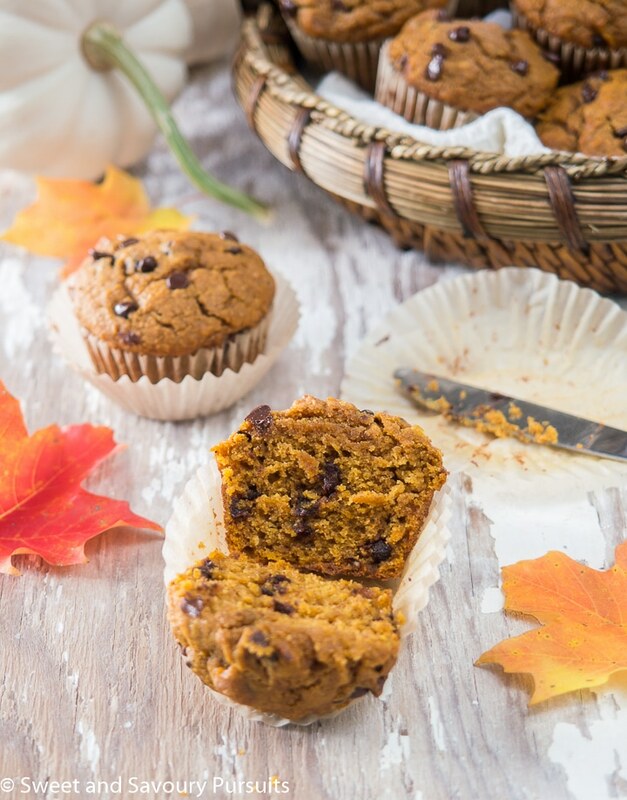 Bake these tender and moist Whole Wheat Pumpkin Chocolate Chip Muffins to experience the delicious combination of pumpkin and chocolate. Autumn is in full swing here, the trees are beautiful with golden and crimson leaves. I will never tire of seeing summer transition into fall, it’s quite a spectacular scene, especially when you are lucky enough to live in an area where an emphasis is placed on preserving as much of nature as possible. Fall also means an abundance of squash in the markets, pumpkin being the most popular especially as we approach Thanksgiving and Halloween. It also means that bakeries and coffee shops are filled with baked pumpkin goods and pumpkin spiced lattes. And that’s fine by me, as I always look forward to having my first pumpkin latte of the season and love to bake with pumpkin. I’ve seen many recipes that combine pumpkin and chocolate but have never actually made or tasted anything, honestly it just never appealed to me. But since this recipe was for the kids, I decided to use chocolate chips instead of nuts. 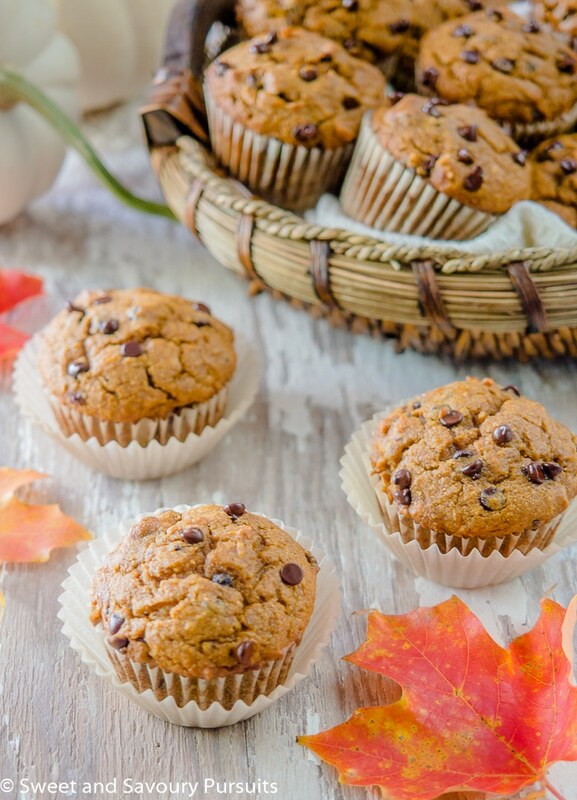 The combination of pumpkin and chocolate turned out delicious, the kids loved them and though my preference would still be nuts over chocolate, these Whole Wheat Pumpkin Chocolate Chip Muffins are excellent! The muffins are spiced perfectly with the combination of cinnamon, nutmeg, ginger and cloves, a classic combination of flavours that complement pumpkin so well. The pumpkin purée makes the muffins very moist and they will stay that way for days. Using whole wheat pastry flour makes them healthier for you without reducing the tenderness or taste of the muffins. I also like using mini chocolate chips in my muffin recipes because they distribute better, but you can use which ever you prefer or have on hand. Adding a few chocolate chips to the top of the muffins before baking them will make the muffins look extra chocolatey and make the kids extra happy :). If you’re a lover of baked pumpkin goods you should try this recipe for pumpkin bread. It’s an excellent recipe that makes two loaves, one to enjoy now and one for the freezer, or you can give it away, that is, if you can part with it! Position a rack in the center of the oven and heat the oven to 350°F. Line a muffin pan with 12 paper cups. In a medium bowl, whisk together the flour, baking soda, baking powder, salt, cinnamon, ginger, nutmeg and cloves (if using). Set aside. In a medium bowl, whisk together the sugars, eggs and oil until well combined. Add in the pumpkin purée and blend well. Add the wet ingredients into the dry and mix using a rubber spatula, do not over-mix the batter, it's fine to have a few lumps. Divide batter between the 12 muffin cups, they should be full. Bake for 18 to 20 minutes, or until a toothpick inserted into the center comes out clean. Let muffins cool in the pan for a few minutes then remove from muffin pan and place onto rack to cool completely. I’m not quite ready to give up gluten in my desserts so I think whole wheat muffins would make a great healthier option for baking, sounds great! Thanks to the worldwide pumpkin shortage, pumpkins in Australia are beyond expensive… but the moment they are more affordable, I’m definitely making these. Love the addition of chocolate chips for a little treat. These look gorgeous! Totally pinning right now! Thanks Jessica, it’s the mini chocolate chips they make everything look great! 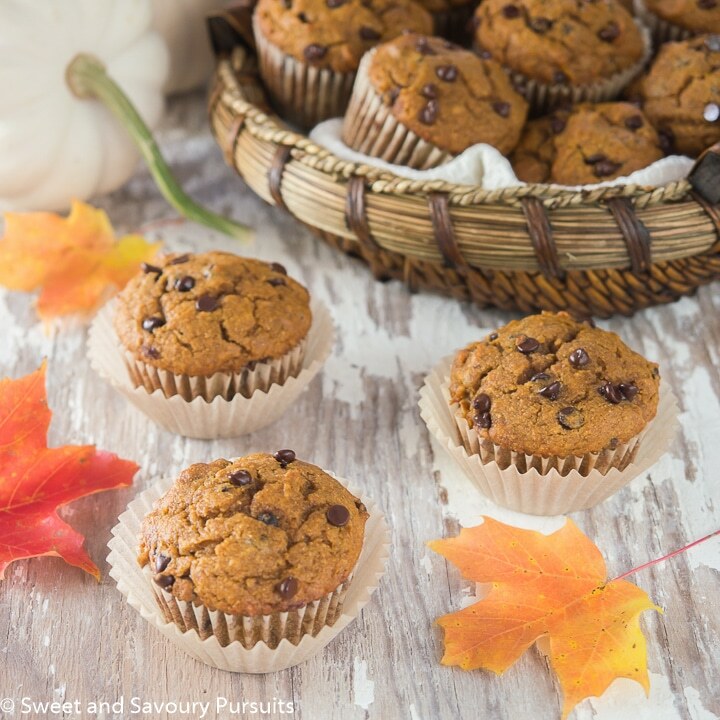 Delicious looking muffins, love everything pumpkin! Thank you so much Lynz. Hope you have a great rest of the weekend! These look great, nice pictures. Yum! These sound like great muffins for this time of year!